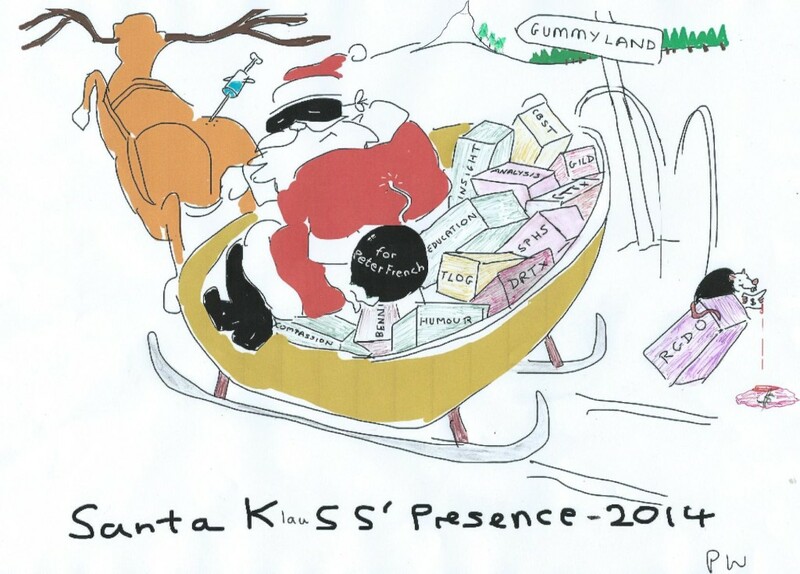 111 Comments on " Happy Christmas Dr. KSS, from all us Gummies"
I have yet to comment on one of your pages, however I’m sure there are many others like me who read all of your articles with great interest and have never said thank you. It is clear you spend many hours every week writing and teaching all of us at SGS and for that I can only say thank you for everything you do. It is an honor to be a part of this community and to learn from someone as knowledgeable as yourself. Wishing you a very Happy Holiday and the best for 2015! I appreciate the time and effort this site requires and for that I am very grateful and say thank you. You have taken the time to personally answer so many questions from many, including myself about many topics and you always give freely. I wish you a speedy recovery, Merry Christmas and a great 2015. I just want to thank everyone for the wealth of knowledge that comes from this page. I’ve been an irregular for a couple of years but just recently started following Dr. KSS and the comments that follow his awesome articles. This site and its followers give so much useful information! Being an irregular has been the best thing thats happened to my portfolio. Looking forward to the Dr’s next article and all the positive posts that follow. Thank you Dr. KSS for all the time you must take writing for SGS! Thank you so much Dr KSS for all your time, efforts, and knowledge you share with us. I am making a donation in your name to St. Jude. Thanks for lending your substantial intellect and serious analytical skill to those of us in Gummieland. Have a wonderful Holiday Season and recover quickly and completely. You helped me, too, Doctor, with motivating me to take some (blessedly minor) health issues up with my own PCP. Also, I have a close friend with NASH, and you’ve given me great insight into those struggles. And I’ve made a bit of money! I hope the holiday season is awesome for you and your loved ones!